A Chess Army That Changes At Your Command! From the folks who brought you Knightmare Chess comes Proteus - a dice game that plays a little like chess and a lot like nothing you've ever seen before! Played on a standard chess board, each side gets 8 dice, with a different piece on each face. You start with 8 pawns, but each turn you get to change one of your dice to a more powerful piece. But as your pieces get more powerful, they become worth more points to your opponent! The game is easy to learn, but mastering the intricate strategies will prove much harder . . . This is a fascinating game based on chess. Whatâ€™s strange is all the â€œpiecesâ€� are dice! Donâ€™t expect a game of random chance though. Proteus offers plenty to think about. Players start with their eight dice with the pawns side face-up. Each turn a player moves a piece just like it would move in chess, then â€œrotatesâ€� another piece. When rotating, a die is turned so the piece represented on the top face changes a step up or down. For example, a bishop can turn up into a knight or down into a pawn. The result is a constantly changing army with potential for multiple threats on every turn. There are a few other twists, like new rules involving the capture of queens and even a new pieceâ€”the pyramid. The game has no King, so victory is achieved by capturing the most points. Several variants are listed in the rules as well. Every time I play Proteus Iâ€™m reminded of what a simple, deep game it is. 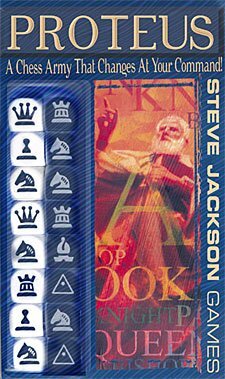 Itâ€™s my favorite of Steve Jacksonâ€™s games based on chess and I recommend it to anyone looking for a new twist on the classic game.